The Moc Chau prairie in the late fall days are immersed in a fairy space with immense white mustard flowers in floating morning mist, green tea fields or brilliant wild sunflowers and poinsettias. 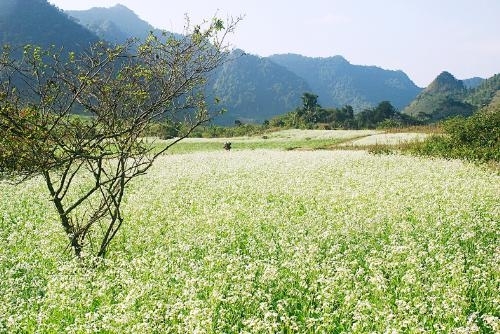 Approximately 200 km from Hanoi, Moc Chau is one of the glamorous destinations of backpackers and photographers, especially in the blooming season of white mustard flowers in October. The weather in Moc Chau in late autumn is cold, with fog in the early morning and sunlight at noon. 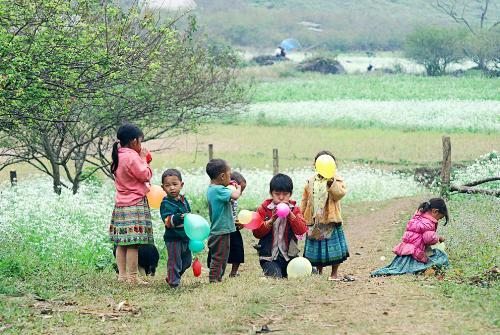 In the autumn, Moc Chau is very charming, when wildflowers blossom along the road. Along the road of 3 km long from Moc Chau town to Nong Truong town, visitors are in stupor before fences of yellow wild sunflowers embracing little houses which are sleeping in the sun. 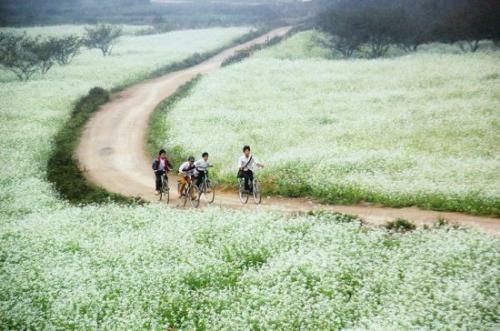 All the fields and hills in Moc Chau are covered by the pristine white of mustard flowers. According to backpackers, the pine forest of Ban Ang (Ang village) is the most beautiful place. Dozens of hectares of fields in this area is covered by white mustard flowers, mixed with the green color of maize, the red color of poinsettias warm and the deep brown color of soil. From a distance, the valley of white mustard flowers looks like a spongy white cloud floating above an immense field, soaked in sweet floral fragrance and the cool mist. This land not only has white mustard flowers but also beautiful green tea hills. When the sun rises, every young green tea leaves are shimmering with tiny dew drops as beautiful crystal. On the way to the Ngu Dong – Ban On, visitors are surprised to see a tea hill in the shape of five interlocking hearts. In the autumn, amid the immense white mustard flower field, tourists with colored sweaters and scarf are busy taking photo. Moc Chau also welcomes visitors with specialties such as veal fried with ginger and citronella, grilled stream fish, fried mustard and sweet taro with pork bones.